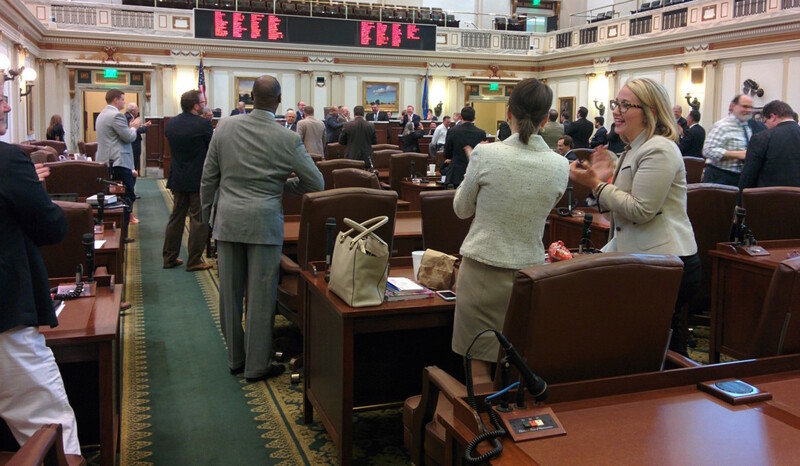 State Reps. Elise Hall (far right) and Katie Henke (center) applaud as the state House adjourns sine die Friday afternoon. The budget, which now goes to the governor, would cut funding to career and technology education, higher education and transportation. At the same time, more funds were steered to mental health services, public safety and the Oklahoma Health Care Authority. Even with budget hikes, however, key agencies said they would likely have to cut spending. “We’ve been telling them all session there would be cuts,” said Rep. Dennis Casey, R-Moorison, vice-chairman of the House Appropriations and Budget Committee. Still, even after daily caucus meetings, arm-twisting by Republican leaders and urgent phone calls from agency heads, the general appropriations bill just squeaked through the state House, 54-42, on Wednesday. The bill fared better in the Senate, passing 38-9. Republican lawmakers said the measure protected the state’s K-12 education system from cuts. Democrats said a flat budget was essentially a cut because of student growth and increased health care costs. Republican Gov. Mary Fallin said the budget “took extraordinary steps” to shield common education from spending cuts. “Under this budget agreement, approximately 51 cents of every dollar appropriated by state government will go toward education,” Fallin said in a written statement. The bill did indeed keep common education at the same level as in 2014: about $2.5 billion. But 49 other state agencies weren’t so lucky, suffering cuts of up to 7.25 percent. House Budget Chairman, Rep. Earl Sears, R-Bartlesville, said the reductions were necessary because of the sizable budget hole. Here is a look at how the budget cuts might affect key state services. Although the budget earmarked an additional $18 million for the Oklahoma Health Care Authority, the agency is still planning to make about $40 million worth of spending cuts. Those cuts include a 15 percent reduction in reimbursement amounts paid to nurse practitioners, physician assistants, physical therapists and other mid-level medical providers. Some physician assistants said the cuts would reduce access to health care in rural Oklahoma and cause many physician assistants to drop out of the Medicaid program. House and Senate budget writers committed early to additional funding for the Department of Human Services, but outside that line-item increase, the department’s regular budget was cut by about .05 percent. For fiscal year 2016, DHS will receive about $16 million extra to fund the Pinnacle Plan, a court-ordered program designed to improve the state’s child welfare system. Support the only statewide investigative reporting publication in Oklahoma. Your contributions to Oklahoma Watch are tax-deductible and will help sustain efforts to produce in-depth reports on the most pressing issues facing the state. Lawmakers and county officials fought over funding for road and bridge projects. After Republican leaders announced they would take almost $72 million from the county improvement roads and bridges programs, county commissioners joined Democrats in opposing the idea. The cuts remained. Additionally, the Legislature reduced the Oklahoma Department of Transportation’s budget by 6.25 percent, which transportation officials said they could absorb. “ODOT will carefully keep all scheduled projects in the eight-year construction work plan as well as maintaining funding for maintenance and asset preservation to ensure that the recent investments in the highway system are not allowed to deteriorate like the I-44 Belle Isle bridge,” ODOT spokeswoman Brenda Perry said in an emailed statement to Oklahoma Watch. Common education was a loser in the 2016 budget even with funding held flat at $2.5 billion, education officials say. The standstill will leave districts figuring out how to stretch their existing money further and will mean teachers will go another year without a pay raise. Oklahoma City Public Schools expects to add up to 1,000 students next school year, diluting its per-pupil revenue. That’s coupled with increases in overhead costs and other expenses, said Superintendent Rob Neu. Superintendent Joy Hofmeister ran for office last year on a platform calling for hiking teacher pay by $5,000 over five years while adding five days to the school calendar. That plan was intended to alleviate the state’s teacher shortage, which educators say is fueled partly by low pay. She has said she will continue to push for teacher raises. In 2013-2014, Oklahoma teachers averaged $44,549 in compensation, which includes base pay and medical benefits. That was the lowest pay in the seven-state region and the fourth lowest average in the nation, according to the National Education Association. At Tulsa Public Schools, the district still has 45 empty teaching positions for the current school year. Trish Williams, the district’s chief financial officer, said finding new teachers remains Tulsa’s biggest challenge. CareerTech, which offers vocational training to students at public schools and technology and skills centers, took a 3.5 percent hit, or $4.9 million. After declaring last fall that its top priority was to offer pay raises to employees, the Department of Corrections has changed its mind. Instead, the agency has decided to spend its $14 million budget increase on dealing with overcrowded prisons, by increasing capacity. In October, the state Board of Corrections approved the department’s budget request for an additional $14.5 million to give 7 percent pay raises to correctional officers and 5 percent raises to other employees. The raises were listed as the top priority in the budget request, which went to the Legislature. The request also sought an additional $26.2 million to increase inmate beds by contracting with private prisons, county jails and halfway houses. That was the second priority. Early in the legislative session, Watkins told a House committee that the corrections system was facing shortages of officers, mental health personnel and support staff, with only 68 percent of authorized positions filled. Prisons also were overcrowded. According to the department, the system is at 112 percent capacity. Sean Wallace, executive director of Oklahoma Corrections Professionals, said the change in funding priorities could further weaken employee morale. Watkins said a final decision on how to spend the $14 million will be made over the next two weeks. “We start putting pencil to paper next week to see where the immediate needs are,” Watkins said. Mental Health: Loss of Services? If predictions hold true, thousands of fewer people will receive mental health and substance abuse services from the state next year. But the Oklahoma Department of Mental Health and Substance Abuse Services is still mulling its choices. It must determine how it will spend the $2 million in additional funding it received for fiscal 2016. The funds could go toward the agency’s core services, special programs such as drug courts or Medicaid matching funds for behavioral health services. In a presentation to a Senate committee earlier this year, White said the department needed $10 million more or it would have to cut services. An increase of $5 million would result in 7,361 Oklahomans losing all services, she said. To maintain services at the current level would require a $20 million hike. White said many budget increases in recent years have gone toward costs outside core services, including crisis services, inpatient services and outpatient behavioral health services. In 2012, the department was given control of Medicaid funds for behavioral health and substance abuse services. Upcoming reductions in the federal share of Medicaid funding would require the state to pick up the difference or cut services. The biggest part of the agency’s budget request, $5.7 million, was to make up for the reduced federal funding for Medicaid. The second biggest part was $3.5 million to fund services for growing numbers of people receiving clients behavioral health services. After legislative leaders announced the budget deal, White said the department is grateful for the $2 million increase.